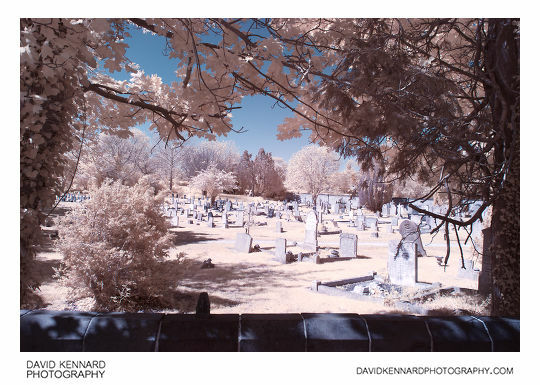 I bought a Hoya 25A filter recently, with the idea of using it for infrared photography. About a week ago I went out on a walk through the village of Great of Bowden with the filter and my Fuji IS Pro camera to test it out. According to Wikipedia (Wratten Number), both the 25 Red Tri colour and 25A Red filters block light with a wavelength below 580 nm. So I'm not sure what the differences between 25 and 25A filters are. It sounds like both would give the same results. Because the 25(a) filter lets through quite a bit of visible red light, it is quite good for false colour infrared photography. (We can see red light with a wavelength up to about 750 nm). I did wonder if there would be any problems due to the visible red light and infrared light focusing at different points. I think that the resulting photos are maybe slightly softer than a pure infrared photo, but there is not a lot of different so far as sharpness goes. 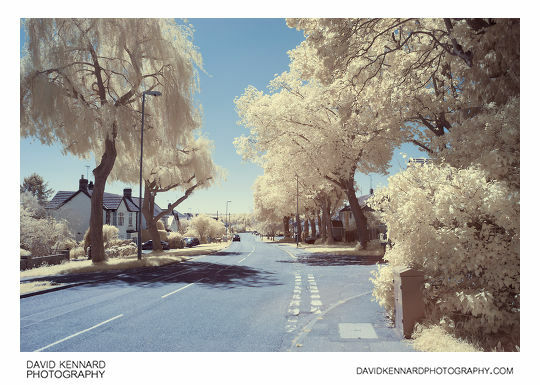 For processing a false colour infrared photo with a blue sky, I first set the white balance on the grass or leaves. Then I opened the file in Photoshop and used the Channel mixer. I changed the red channel to 0 red and +100 blue. On the blue channel I changed it to +100 red, about -5 green, and -10 blue. This gives the grass and foliage more of a yellow colour. I found the resulting blue sky colour was a bit purple for my liking. Probably this could be fixed playing around with the channel mixer a bit more. But I found it easiest to use a hue / saturation adjustment to adjust the hue slightly. I can't remember exactly how I processed the photos. I think I used the 'Blue Dawn' effect followed by the 'Sepia Toner' and / or 'Tonal Contrast'. I adjusted the opacity of each effect so they wouldn't be too strong. 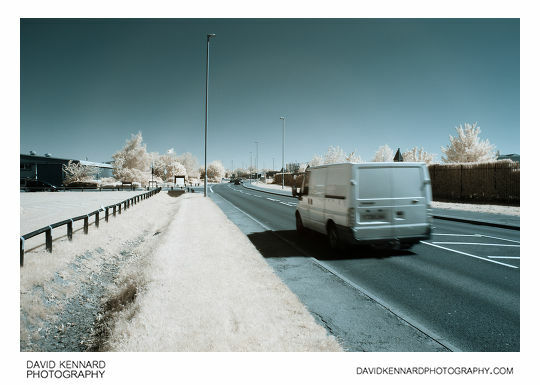 With the false colour infrared photos I didn't make them very contrasty, going for more of a slightly washed out pastel look. I like the effects I can get with this filter, and the big bonus is that you can see through the camera's viewfinder with the filter attached. I have now ordered the Lee 25 Tri Color polyester filter, so I can hopefully get the same effect for my fisheye lens. I’m trying to get into the world of IR photography, and I already own the Fuji IS Pro. I really like the look of your false color infrared images, but I cant quite figure out how you’re doing it. 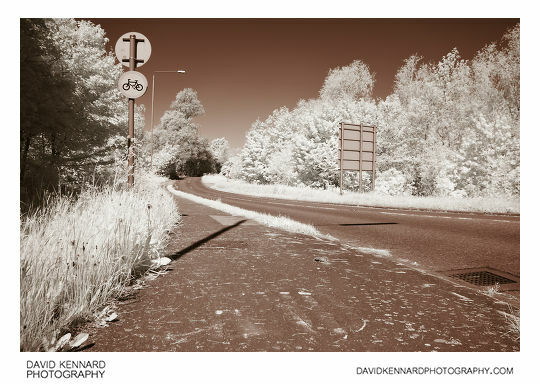 Is it a combination of an infrared filter and a colored filter? I’ve noticed using an IR filter all on it’s own tends to give me an almost entirely purple cast under artificial light. Is this something that will change in natural light? I think the colour cast depends on your white balance. 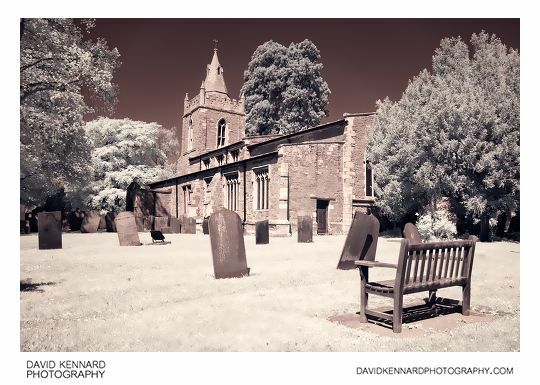 The false colour images in this post were obtained using just a Hoya 25A Red filter. This filter passes both visible red as well as infrared light, which makes it more suitable for false colour photos. 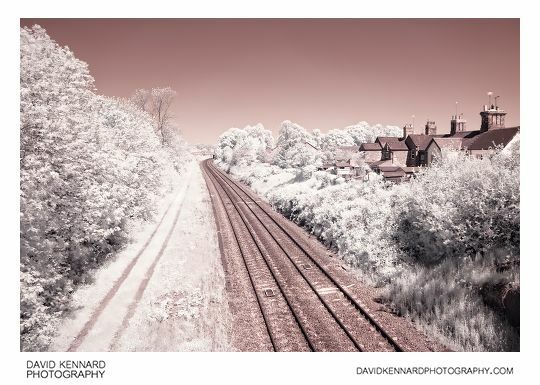 If you use a strong infrared filter, such as the B+W 093, then you will only be able to get black and white (or single colour tinted) images as it doesn’t pass any colour for the camera to record. For changing the colour in the photos, I usually play around with the white balance. For the ‘traditional’ false colour IR photos, I set the white balance on grass / foliage. Then I use the channel mixer in Photoshop to swap the red and blue channels. These are all taken with a camera that has no IR blocking filter in front of the sensor. If you use a standard camera with this filter you’ll just get an image that is very red, with no IR effect. 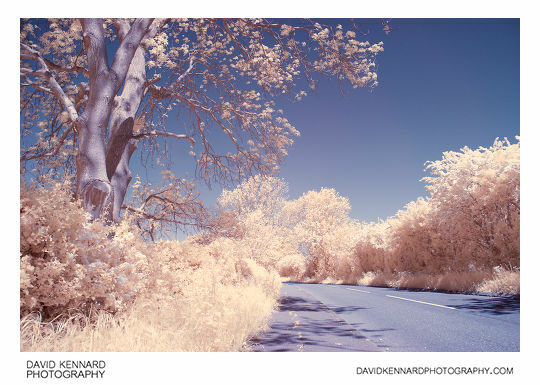 I did a comparison recently between use of a converted and unconverted camera for infrared work: Infrared photography – Unconverted vs Converted camera with different IR filters comparison. If you look at the image there that was taken with the 680nm filter (bottom right corner of the comparison image), the Hoya 25a filter will give somewhat similar results.